Bread baking is a skill and achieving a product that you will actually eat might take awhile. Bread baking is only less expensive than bread buying if you actually consume the product. Just like cooking, baking improves with practice. Baking the same recipe every week also has advantages. Routine and correction of past mistakes, for instance. Beyond the fact that many people bake because they gain satisfaction and even joy out of the process, baking your own bread may be healthier than buying at the store. Fewer additives and total control of the quality of ingredients are important considerations. Time is a factor, but timing can help even busy people bake bread. Baked bread and bread dough freeze well, too. A pound of King Arthur flour costs about one dollar. We could pick a less expensive flour but KA makes good bread and the whole wheat is the same cost as the white bread flour. One teaspoon of salt costs less than one penny. Yeast, a huge variable. A cake of yeast can cost $1.50 for 1/2 ounce at the supermarket. Again, at King Arthur, you can order a pound of yeast, enough to make 96 loaves of bread, for about $6.00. That's 6.2 cents per loaf. For someone who wants to save money by baking at home, this would be the way to go. Electricity at 10 cents or more per kilowatt-hour, an oven pulling 2600 watts will cost about 26 cents per hour to operate. This is a simplification, but you can buy a device to measure your oven's electrical consumption and multiply that result by the cost per kilowatt on your monthly electrical bill to find out how much it would cost to bake a loaf in your own house. Remember, if you bake two loaves of bread, the cost to bake per loaf is cut in half. If you bake your bread sequentially, you will at least save the cost of pre-heating the oven for the second loaf. So one oven usage (about two hours, electric) will cost about 50 cents. The least expensive loaf we buy at the store is a packaged whole wheat sandwich loaf for around $2.50. "Artisan" breads at the supermarket sell for $4.00 to $5.00. Both packages show a list of about 20 ingredients. Oatmeal bread is only a few cents more to make than the French bread described above. Also, try sourdough "Bauernbrot". It costs about $1.50 more than the French bread above but makes a two-pound loaf. 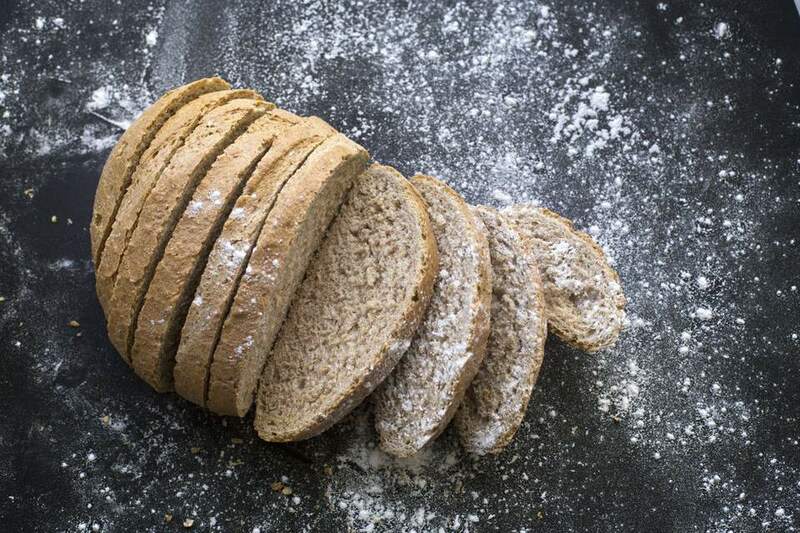 A 100% whole grain bread, German Seed Bread, is more expensive but offers quite a bit in the nutritional arena. Sunflower seeds are good sources of folic acid, pumpkin seeds are high in zinc, and sesame seeds high in copper and manganese. How does Chlorine in Tap Water Affect Bread Making?